Posted 8 February 2018 by Richard & filed under Biographies & Pen Portraits. (British physicist, mathematician and brewer born in Salford Lancashire was a brilliant experimenter and scientist who studied the nature of heat and laid the foundations to thermodynamics and kinetic theory through a number of pioneering discoveries and initiatives). James Prescott Joule was born on New Bailey Street, Salford near Manchester on 24th December 1818 son of Benjamin and Alice Prescott and was one of five children. His father was a wealthy brewer a business which he succeeded to later in his life. He was mostly home-schooled by his aunt and later studied arithmetic and geometry under John Dalton a famous chemist at the Manchester Literary and Philosophical Society. He later studied under the famous scientist and lecturer John Davies. Slightly deformed, with symptoms of spinal problem, Joule started working in his father’s office at the age of 15 where he acquired an interest in science and came to to appreciate the relationships between the temperatures and pressures of gases, between pumping and heating, simply by observing the brewery in operation. Interest to note this was similar to Priestley who studied the properties of carbon dioxide in a brewery. Joule was driven by a powerful love of experimental investigations and was an outstanding experimenter. Joule studied twice a week under John Dalton then president of the Manchester Philosophical Society from 1817 to 1844. Dalton was largely responsible in imbuing Joule love of experimentation. When he was 19 years of age Joule converted one of his father’s rooms into a laboratory and constructed an electro-magnetic engine and published his first scientific paper. He submitted his first findings for publication to William Sturgeon’s ‘Annals of Electricity’. In 1840 he replaced the brewery’s steam engines with electric motor and achieved greater efficiencies. In 1841 he carried out an experiment to establish the relationship between electrical resistance and heat in a conductor this became known later as Joule’s first law. In 1843 Joule announced his discovery what became the first law of thermodynamics *(see below) which related the relationship between energy and work. 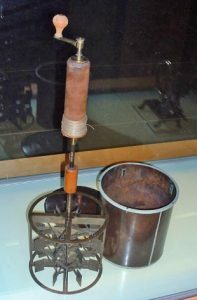 In 1844 he measured the ratio of work needed to compress a gas to the heat of 4.27 joules/calorie. 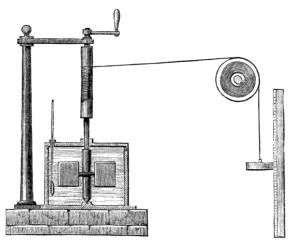 In 1845 Joule reported an experiment using a paddle wheel (see the two diagrams below) to understand the conservation of energy. He proposed that in the experiment mechanical energy was converted into heat emery and this later became known as the ‘Law of Conservation of Energy’. By 1849 he showed the indestructibility of energy – the conservation of energy, the mechanical equivalent of heat and the existence of absolute zero. He provided the foundation for mathematicians to develop the theory of heat and the importance of efficiency of heat engines on their working temperatures. He did not need the prestige of being a university professor to promote his discoveries to the world of science. For example in 1847 at the age of 28 he presented a lecture explaining his discovery of the laws of the conservation of energy at St. Ann’s Church, Manchester. He read papers at the British Association at Cork (Ireland) in 1843, at Cambridge in 1845 and Oxford in 1847. Before he reached the age of 30 he was elected to honorary membership of the Royal Academy of Science at Turin and the Royal Society. In 1854 he sold the brewery and moved to Oak Fields, Whalley Range. South Manchester and continued to work for long hours and paid little attention to his health. In 1861 he moved again to Thorncliffe, Old Trafford. Throughout his research he attracted criticisms from neighbours about the noise of his experimental engines. He had met William Thomas also known as Lord Kelvin in 1847 at one of his presentations at the British Association in Oxford and later worked closely with him making many important discoveries including the Joule-Thomson effect – namely measuring the temperature changes when forcing a gas or liquid through a valve kept insulated so that no heat is exchanged with the environment and the concept of absolute zero. They also further improved the efficiency of steam engines especially for marine use. The two men laid the foundations of kinetic theory including the velocities of molecules through air. They worked together for over ten years. He also worked closely with Lyon Playfair who was a strong advocate of technical education (See biography on this website). He often suggested that his theories linking heat and mechanical work would show that the water at the bottom of water falls would be higher than at the top and he with others to visit the Niagara to verify this finding. In 1878 he received a civil list pension of £200 per annum from the British government in recognition of his services to science. Joule achieved ground breaking discoveries over a period of forty years and is now recognised for this by the adoption of the Joule the S.I. physical unit of work/energy. 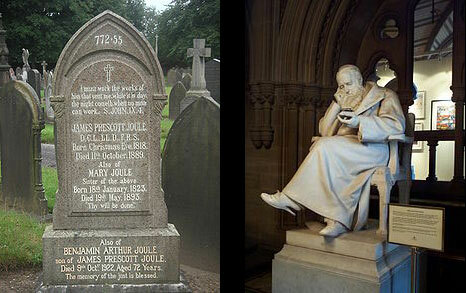 Joule died on 11th October 1889 and buried in Sale at the age of 70 years. The gravestone is inscribed with his 1878 measurement of the mechanical equivalent of heat namely 772.55 a figure which is very close to todays’ value again showing his brilliance as a researcher (Se diagram below). A statue of him by Alfred Gilbert is placed at the entrance of Manchester Town Hall opposite to John Dalton (See diagram below). A pub located in Sale ‘The J P Joule is named after him and the family brewery now exists in Market Drayton. Honours: Fellow of the Royal Society (FRS) 1850. RS Medal 1852, Albert Medal (RS) 1880, Copley Medal 1870 and a number of honorary degrees. President of Manchester Lit and Phil Society 1860. President of the British Association for the Advancement of Science 1872. When heat is converted to work, the process is never totally efficient, e.g. when steam drives a piston, most of the heat energy in the steam is converted to mechanical energy but some is wasted heating up the sides of the cylinder. The first law of thermodynamics states that the energy used in doing work will be equal to the amount of work done – that energy cannot be created or destroyed. J P Joule. ‘On Matter, living force, and heat’. Lecture given in 1847, reprinted in S.G. Brush. ‘Kinetic Theory’ Volume 1. ‘The Nature of Gases and of Heat’. New York: Pergamon Press. 1965. Joule. J.P. ‘The Scientific Papers of James Prescent Joule’. London. Dawson’s. 1965. Bottomley, J.T. ‘James Prescott Joule’. Nature. 26. Pages 617-20. 1882. Cardwell, D. S. L. ‘James Joule: A Biography’. MUP. ISBN 0719034795. 1991. 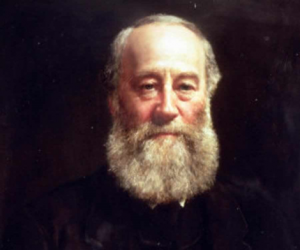 Fox, R. ‘James Prescott Joule 1818-1889’. In J. North. ‘Mid-19th Century Scientists’. Elsevier. ISBN 0-7190-3479-5. 1969. Steffens. H. J. ‘James Prescott Joule and the Concept of Heat’. Watson. ISBN 0-88202-170-2. 1979. Richard Evans on General National Vocational Qualifications (GNVQs) 1992-2007.
kate on General National Vocational Qualifications (GNVQs) 1992-2007. © 2019 Technical Education Matters.